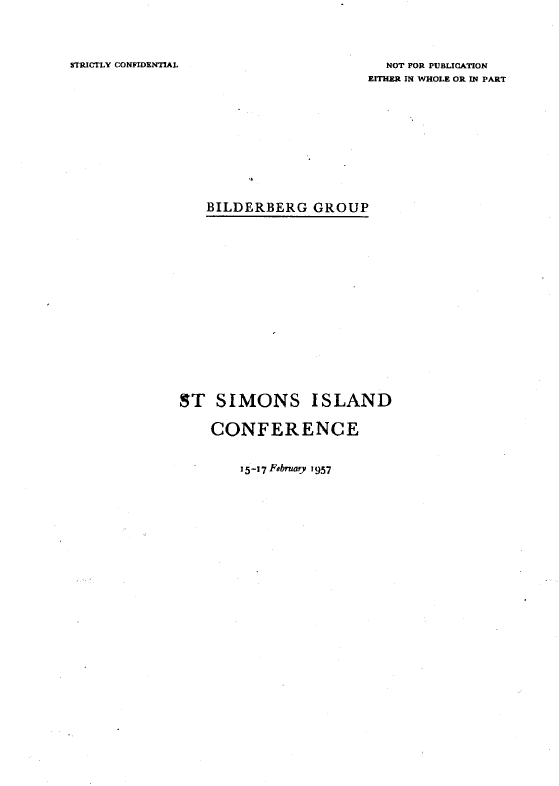 The fifth Bilderberg Conference met in the USA on St Simons Island, Georgia. It was the first _to be held in America. The first four were held in the Netherlands, France, Germany, and Denmark. Seventy persons attended from twelve different countries; whatever their status or function in public life they all took part in a purely personal capacity. Like all other meetings of the Bilderberg Group this Conference set as its purpose the frank discussion of problems of common concern to the nations of the Western Alliance. Its members were all informed persons of authority and influence in their respective countries. Since difficulties and differences are bound to arise among any group of democratic peoples which believes in the right of dissent, the Bilderberg Group aims at contributing towards a reconciliation of divergent views and interests by providing the opportunity of free discussion among leaders of opinion who share a common desire to achieve a better understanding of one another’s motives and intentions. For this reason, the subjects chosen for discussion at Bilderberg Conferences mainly concern questions on which the Western Alliance may have difficulty in agreeing. Fruitful discussion requires an atmosphere of mutual trust, so that participants can express themselves in complete frankness. This has been largely achieved at all the Bilderberg Conferences because the meetings are held in private, the press and public are excluded and neither background papers nor speeches are published. In the final printed report, like the present one, opinions are summarized and speakers are not quoted by name. The Conferences of the Bilclerberg Group do not aim to formulate policy or even reach conclusions-no resolutions are submitted for discussion or voted upon. The purpose of the debate is to present a comprehensive review of the problems on the Agenda from which each participant is (ree to draw his own conclusions. It is hoped, however, that as a result those who attend the meetings may be better equipped to use their influence so that the Atlantic alliance may function better. 1. Review of events since the fourth Bilderberg meeting in May 1956. 2. Nationalism and neutralism as disruptive factors inside the Western Alliance. 4. The European policy of the alliance, with special reference to the problems of Eastern Europe, German reunification and military strategy. Background papers were circulated before the meeting to provide information for the discussion or to focus debate on particular issues. Some of these papers covered questions which time did not permit the fifth Bilderberg Conference to reach. Following normal custom, as each new subject was broached, the authors of the relevant papers opened the discussion by commenting upon them. The Bilderberg Conferences are held throughout in plenary session so that any member may participate in any of the discussions. Advantage is also derived from the opportunities for informal conversation outside the conference room among participants, who spend three days living together in the same hotel away from the distractions of the city. The fifth Bilderberg Conference benefited considerably from the pleasant climate and agreeable surroundings of the King and Prince Hotel which was taken over exclusively for the meeting.